A visit to Australia’s 2016 Heritage and Cultural Tourism Attraction of the Year, Bendigo Tramways, will leave you in awe. 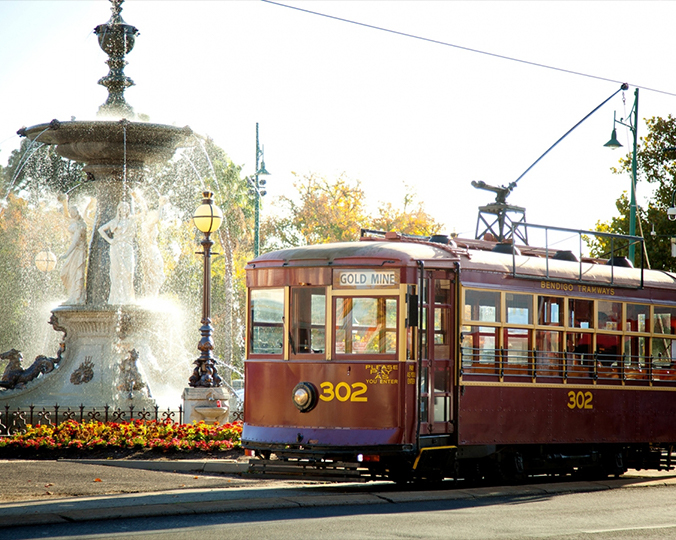 There’s no better way to see the sights of Bendigo than aboard one of our iconic Vintage Talking Trams. Join us for a journey of discovery into the unique and fascinating traditions of Bendigo’s first people, the Dja Dja Wurrung, and hear a story more than 40,000 years in the making. This tram has been adorned inside and out with striking Aboriginal artworks created by emerging Dja Dja Wurrung artist, Natasha Carter. The special commentary has been written and narrated by the Dja Dja Wurrung Clans Aboriginal staff and members and was produced by prominent musician and composer David Bridie. From trams that have been used for housing to those that have carried royalty, you’ll discover the colourful history.